In calling the “outing” of LGBT church workers so that they will be fired a replay of the McCarthy witch hunts of the 1950s, The National Catholic Reporter’s columnist Michael Sean Winters may have launched the strongest statement yet opposing these tactics used by conservative Catholic organizations and the bishops who listen to their complaints. Noting that we are approaching the 62nd anniversary of Joseph Nye Welch’s famous retort to Senator Joseph McCarthy’s badgering of Welch’s colleagues–“Have you no sense of decency, sir? At long last, have you left no sense of decency?”–Winters has resurrected this powerful response to bullying tactics to discuss the U.S. Catholic Church’s ongoing scourge of firing LGBT church workers, of whom a number had been living quiet lives until conservative groups reported them to bishops. Archbishop Emeritus Desmond Tutu’s daughter Reverend Canon Mpho Tutu-Van Furth has decided to quit her job after her licence to preach was revoked. Mpho told City Press she may no longer officiate in church because she married a woman. Newlyweds Mpho and Marceline Tutu-Van Furth are on honeymoon in Bali after their wedding at a Franschhoek wine estate attended by Mpho’s parents, Leah and Desmond Tutu. Mpho told the newspaper she had decided to “give up” her ministerial duties – her authority to preside at Holy Communion, and to officiate at weddings, baptisms and funerals in South Africa. Reverend Canon Mpho Tutu-Van Furth has revealed that her licence to preach is being revoked because she married a woman – so, she’s decided to quit instead. Newlyweds Mpho and Marceline Tutu-Van Furth are on honeymoon on the Indian Ocean island of Bali after their wedding at a Franschhoek wine estate attended by Mpho’s parents, Leah and Archbishop Emeritus Desmond Tutu. “Bali is quite magical,” said Mpho in an email to City Press, adding that she had decided to “give up” her ministerial duties – her authority to preside at Holy Communion, and to officiate at weddings, baptisms and funerals in South Africa. “Because the South African Anglican Church does not recognise our marriage, I can no longer exercise my priestly ministry in South Africa,” she said. “The bishop of the Diocese of Saldanha Bay [Bishop Raphael Hess] was instructed to revoke my licence. On Saturday last, Msgr Krzyxtof Charamsa came out and announced not only he is gay but also that he has a devoted boyfriend – and was promptly fired from his jobs as a Vatican theology professor and senior theologian with the CDF. (He later said in a follow -up interview, that his coming out was a “profoundly Christian” act. Yesterday, just two days later, another priest was fired, this time in Chicago, for “an inappropriate relationship with a man”. It’s widely known that the priesthood includes an extraordinarily high percentage of gay men. We should expect that more and more of them will begin to come out, voluntarily or otherwise. The Church simply cannot afford to fire them all – or the existing shortage of priests will just become even more acute. Then, on Monday, the Archdiocese of Chicagoannounced that Marco Mercado, who oversaw the Shrine of Our Lady of Guadalupe in Des Plaines, has been removed from his position because of “an inappropriate relationship with an adult man.” In this case, the priest was remorseful, not defiant. “I apologize if this scandal has caused any hardship to the faithful,” Mercado said in a statement, according to the Chicago Tribune. Under any circumstances, these would be remarkable firings. But the timing is significant: This weekend, Roman Catholic bishops gathered in Rome to kick off their synod on so-called family issues, the continuation of a meeting that began last fall. 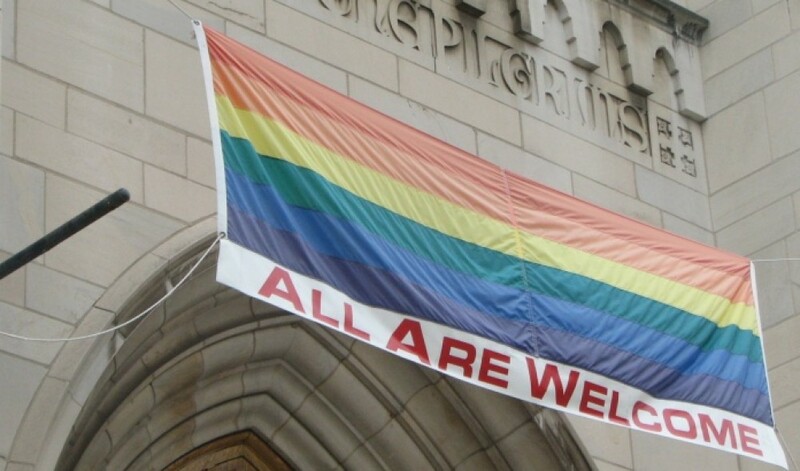 Among the subjects possibly on the docket: the Church’s posture toward gay Catholics. A priest who came out as gay has been fired from his positions at the Vatican, the latest in a long and growing list of church workers who have lost their jobs over LGBT identities or support. Bizarre. Sexual orientation is NOT specific to gay people, and is NOT a matter of “self – expression”. The right to be treated with respect, compassion and sensitivity, and freedom from any malice or violence, in speech or in actions, are clearly embedded in Vatican teaching on the subject, There is absolutely nothing in the Milk quotation that is remotely in conflict with standard Church teaching – but the school’s action clearly is. In Ontario, Canada, there has been an ongoing struggle in state-funded Catholic schools to comply with a law there to allow gay-straight alliances (GSA) to form. This controversy added a new wrinkle to it recently when a Catholic school in a Toronto suburb refused to allow a student to use a quote from gay-rights leader Harvey Milk on a poster for the GSA. Carol Parker and Josie Martin have been committed to one another for nearly two decades, but their love did not stop one priest from denying Parker Communion at her mother’s funeral last December. “She added that at the funeral, most in attendance chose not to take Communion out of respect for her and Ms. Martin. Despite this show of solidarity, the women no longer feel welcome at the church and have begun visiting another an hour from their home. Click this graphic to share it on Facebook!